A fish hook or fishhook is a device for catching fish either by impaling them in the mouth or, more rarely, by snagging the body of the fish. Fish hooks have been employed for centuries by fishermen to catch fresh and saltwater fish. In 2005, the fish hook was chosen by Forbes as one of the top twenty tools in the history of man. Fish hooks are normally attached to some form of line or lure device which connects the caught fish to the fisherman. There is an enormous variety of fish hooks in the world of fishing. Sizes, designs, shapes, and materials are all variable depending on the intended purpose of the fish hook. Fish hooks are manufactured for a range of purposes from general fishing to extremely limited and specialized applications. Fish hooks are designed to hold various types of artificial, processed, dead or live baits (bait fishing); to act as the foundation for artificial representations of fish prey (fly fishing); or to be attached to or integrated into other devices that represent fish prey (lure fishing). The fish hook or similar device has been made by man for many thousands of years. Neolithic fish hooks have been recorded from Palestine about 7000 BC. In 2011, archaeologists in the Jerimalai cave in East Timor discovered what was then the world's oldest fish hook, a shell hook between 16,000 and 23,000 years old.However finds also made from sea snails some 23,000 years ago and predating the East Timor finds were reported from Okinawa. An early written reference to a fish hook is found with reference to the Leviathan in the Book of Job 41:1; Canst thou draw out leviathan with a hook? Fish hooks have been crafted from all sorts of materials including wood, animal and human bone, horn, shells, stone, bronze, iron up to present day materials. In many cases, hooks were created from multiple materials to leverage the strength and positive characteristics of each material. Norwegians as late as the 1950s still used juniper wood to craft Burbot hooks. Quality steel hooks began to make their appearance in Europe in the 17th century and hook making became a task for specialists. Commonly referred to parts of a fish hook are: its point - the sharp end that penetrates the fish's mouth or flesh; the barb - the projection extending backwards from the point, that secures the fish from unhooking; the eye - the end of the hook that is connected to the fishing line or lure; the bend and shank - that portion of the hook that connects the point and the eye; and the gap - the distance between the shank and the point. In many cases, hooks are described by using these various parts of the hook. Example: Wide gap, 2X Long Shank, Hollow Point, Turned Down Ring Eye Bait hook. There are a large number of different types of fish hooks. At the macro level, there are bait hooks, fly hooks and lure hooks. Within these broad categories there are wide varieties of hook types designed for different applications. Hook types differ in shape, materials, points and barbs, and eye type and ultimately in their intended application. When individual hook types are designed the specific characteristics of each of these hook components are optimized relative to the hook's intended purpose. For example, a delicate dry fly hook is made of thin wire with a tapered eye because weight is the overriding factor. Whereas Carlisle or Aberdeen light wire bait hooks make use of thin wire to reduce injury to live bait but the eyes are not tapered because weight is not an issue. Many factors contribute to hook design, including corrosion resistance, weight, strength, hooking efficiency, and whether the hook is being used for specific types of bait, on different types of lures or for different styles of flies. For each hook type, there are ranges of acceptable sizes. For all types of hooks, sizes range from 32 (the smallest) to 20/0 (the largest). Hooks are designed as either single hooks—a single eye, shank and point; double hooks—a single eye merged with two shanks and points; or triple—a single eye merged with three shanks and three evenly spaced points. Double hooks are formed from a single piece of wire and may or may not have their shanks brazed together for strength. Triple hooks are formed by adding a single eyeless hook to a double hook and brazing all three shanks together. 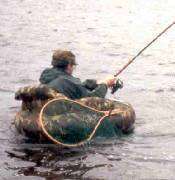 Double hooks are used on some artificial lures and are a traditional fly hook for Atlantic Salmon flies, but are otherwise fairly uncommon. Triple hooks are used on all sorts of artificial lures as well as for a wide variety of bait applications. ↑ "The world's oldest fishing hook has been found in a cave in East Timor". Australian Geographic. 25 November 2011. Archived from the original on 28 August 2012. ↑ "World's oldest fish hooks found in Japanese island cave". BBC news. 18 September 2016. Retrieved 18 September 2016. ↑ "The Bird has returned to the Nest". Retrieved 2010-11-09.